Maybe you have also noticed your waist line expanding or your recent blood work has shown that you are becoming pre-diabetic. The reasons to try to live a low-carb lifestyle have been established- but how do you actually implement it? Of note, not everyone needs to use this method to lose weight and stay healthy, but it is quite effective in those who are showing signs of insulin resistance (see previous posts). How do you figure out how many carbohydrates you are eating? How many carbs should you be eating? Can vegetarians eat this way? How will you handle social situations? Will you be hungry? Do any individuals implementing this lifestyle need to make this change under the guidance of their physician? (yes! if you are on medication for diabetes, you do). Let's delve into some of these questions. No one likes measuring and calculating what they are eating and it can be a daunting task. The key to eating low carb is to figure out how many "net carbohydrates"are in a food (see below), decide on a target for how low carb you are going (see next post! ), and then once you are in the habit of eating this way, you won't need to think as much! And no more calorie counting! You will eat enough protein (see future post to figure out how much that is) and enough fat to feel full while limiting the carbohydrates as explained below. Examples of whole, unprocessed foods that are low in net carbs are green vegetables like broccoli, spinach, cabbage, green beans, asparagus, and salad greens. These kinds of vegetables typically have 1-3 grams of net carbs per 3 1/2 oz serving. Fruits are higher in sugar and are "nature's dessert" so on a low carb diet, these need to be eaten sparingly. Berries are a great option on a low carb diet, but note that they have more net carbs than vegetables: Ex. 6 grams for strawberries (3 1/2 oz) and 12 g in blueberries (3 1/2 oz). If you compare this to a medium sized apple, which has 18 grams, you can see why berries are a better choice! As you can see, green vegetables that grow above the ground are a great way to fill your plate and get lots of fiber. For a great visual resource for information on net carbs and a low carb lifestyle, please refer to https://www.dietdoctor.com/low-carb. In general, if you are eating foods that come from a package, they are going to tend to be processed and higher in carbohydrates. However, if you are buying frozen entrees, protein shakes or dairy products like cottage cheese and greek yogurt, you will want to know how to include these in your diet. Try an app like myfitnesspal to look up nutrition data and keep track of your carbohydrate intake. You can also look up nutritional content on websites like http://nutritiondata.self.com. You MUST get in the habit of reading food labels. We have been trained to look at the fat content- ignore the fat! 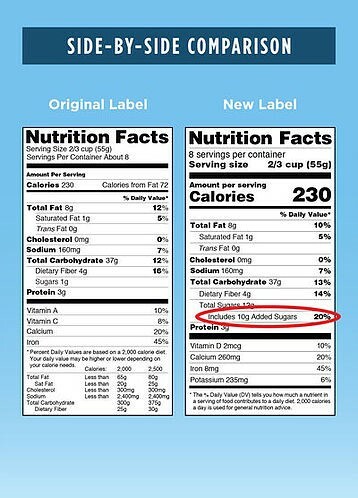 New food labels have been mandated for this reason- the focus is moving a way from fat. 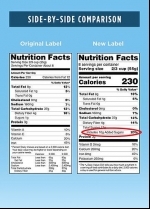 New food labels on most packaged foods will be out in July of this year. Look at the grams of total carbohydrates, fiber and added sugars. In the example below, Net carbs = (Total carbs) 37g - (Dietary fiber) 4 g. This item has 33g net carbs in a serving size of 2/3 cup. In today's post, we have reviewed how to calculate how many carbohydrates you are eating and also touched on some great low carb options to include in your diet. In next week's post, I will give you more information about what foods to eat on a low carb diet and will also discuss HOW MANY CARBOHYDRATES to eat daily in order to reverse abdominal weight gain and problems like pre-diabetes and diabetes. In a future post, I will discuss the buzz around the Mediterranean diet and how it is not really that different than a low carb diet!